Modern Vespa : FAQ: Shudder, graunching noise on take-off? Sealion? FAQ: Shudder, graunching noise on take-off? Sealion? If your Vespa judders on take off, it is usually due to a hot clutch. Sometimes the clutch bell gets glazed or dusty and needs a bit of a clean. 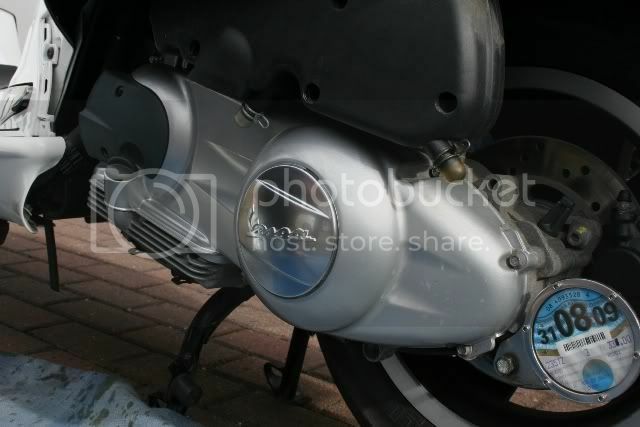 Some people recommend using Brakleen spray through the holes on the transmission cover which are accessible when you remove the chromed Vespa cover. I have the squeaky sealion issue too, sometimes at idle if the fuoco's idle goes up a bit. Is there any other comments apart from rough up the clutch bell and clutch pads with sandpaper and look for abnormal wear. I have access to a lathe so was wondering if it would be worth taking a tiny bit off the clutch surface with that. And I mean a tiny bit.. If I may chip in on this. I'm ex-tech and have sorted this issue on many cvt centrifugal dry clutch bikes. Yes, there is a solution to this clutch squeal and judder! I appreciate many of you already may know this but for those that don't this could be invaluable. I'm seeing above in this thread only part of the issue being dealt with so that's the reason for this post. The solution is easier than you may think. After extensive testing on mainly Burgman 400's and the GTS250 and 300's (I've been servicing one for a colleague), I can categorically state the main cause of judder at move off is clutch dust and clutch pad glazing. Rider technique is also a factor in how often this issue arises. This judder is not a fault, but is something that can be avoided with proper maintenance. The belt is not an issue in causing this clutch judder. But here's the thing. Although some folk know what to do to fix the issue, they don't do it right! Read on please. So, the glazing of the clutch pads is caused, as many of you will already know, by the resin in the clutch pads heating up during move off. The pads get hot and the resin in the clutch pad fibres rises to the surface. This hardens the surface of the pads that contact the bell. During subsequent move off's the pads continue to heat up and some of the resin transfers to the clutch bell. This also mixes with small quantities of clutch dust and the whole clutch thing becomes juddery with often a small squeal at move off. It can be worse when cold or better when cold. It depends how much dust is present in the bell. This is a fairly universal issue with dry cvt centrifugal clutches. It has affected my Burgman, Honda Silverwings, Maxsym 400 and 600's and any bike with this sort of dry clutch transmission. When fixing the issue it is critical to do the right thing. Wrong or poor maintenance is the cause of clutch judder returning very quickly. If done right you will not have reoccurrence of the judder for many thousands of miles. As the guys are saying, clean out the clutch bell and roughen the surface slightly. I use 100 grit for this and you don't have to go mad at it. Break up the glaze in the bell and spray brake cleaner in it. And as you rub the bell with emery paper, use an even rubbing technique and avoid rubbing in just one place for any length of time. Next, leave to one side. Then, using a small flat wooden block you must CAREFULLY sand the clutch pads. This is the bit folks often get wrong. First make sure you use at least 100 grit on the pad, I use 80 grit. You need to expose the nice clean fibres on the pads and remove all resin. But you don't have to take much material off to do that. Use nice even strokes on the pad and go all the same way as you do it. Use a face mask to stop you breathing in the dust. You should always use a wooden block with the emery paper wrapped around it. DO NOT USE YOUR FINGERS WITH THE EMERY PAPER ALONE. Doing so exerts slightly uneven pressure, however small, on the clutch pads and causes them to become uneven very slightly. It's difficult to see this too so you won't realise it. This means uneven clutch contact patches forming and it will cause the judder to come back very quickly within days or just a few hundred miles. You also get clutch dust building up in the uneven 'dips' in the pads making everything worse. So the secret is to keep the clutch pad surfaces absolutely flat in every plain. Also bevel the leading edge of each clutch shoe pad to allow smooth engagement. There is no need to spray brake cleaner on the clutch pads. If you notice that after sanding the clutch pads there are uneven places showing (you may have to look hard) then sand just a little more. I'd take roughly the same amount off each shoe to keep things even. The pads last a long time so don't worry about the sanding shortening there life span. In total it's not much you should have to remove. I've proven over and over that this technique works completely. I used to service many many cvt bikes and all complained of this sort of issue. In every case it was because owners did not carry out the maintenance of the clutch correctly. My technique has worked for all of them with no repeat of the judder for thousands of miles. Even those guys that run in town most of the time with lots of stop start. But this leads me to the next point (yeah, sorry it's a long post!). The correct moving off technique is crucial to maintaining a smooth clutch too. Don't move off slowly with a static low throttle setting. This encourages the clutch to slip more than it needs to heating it up and causing more dust and glazing. IMHO, the best method (and proven) is to wind on the throttle a little more that you need to and let the bike drive off the line in a sprightly manner, adjusting the throttle to get the speed you need after the clutch has locked up. It works! All the guys who's bikes I serviced and who had this clutch issue have adopted this type of move off. No one has ever had to have their clutch deglazed and cleaned out at anything more than the 15k service intervals on the Burgmans an 9k on the GTS. In fact, the GTS guy is coming in later this year for his 9k service. I'll be sorting his clutch maintenance so will do some photos and show you how I do it for those that are interested. But it won't be until summer. I appreciate some of you know all this stuff, but it's worth posting about this sort of stuff. People suffer in silence on this issue I've found and it doesn't need to be. It's curable. Good luck!